Well, not my memories, as I've never been there, but today's selection of tunes is bound to provoke some nostalgia among those of the East African persuasion. As in my last post, these 45s, which were all issued in the early '80s, were excavated by myself from a cache of 10" tape reels that I dubbed more than twenty years ago, digitized and reprocessed for your listening pleasure. I think I got all of these recordings from my old friend Edmund Ogutu. Wherever you are, Edmund, thanks! Sadly, Daniel Owino Misiani, founder of the influential Kenyan band Shirati Jazz (also known as the D.O. 7 Band and D.O. 7 Shirati Jazz), passed away on May 17, 2006, but he left a legacy of hundreds of memorable tunes. 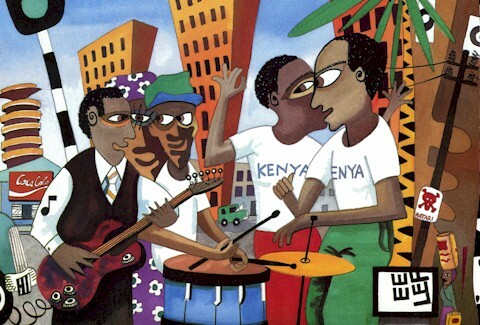 While Misiani and Shirati Jazz did not establish benga music, they did more than anyone else to popularize and codify that musical style. The picture at the top of this post is from the Shirati Jazz release Benga Beat (World Circuit WCB 003, 1987).